Happy New Year! Merry Christmas! Those are some things I had been wanting to wish you all in posts over the holidays but I took a little unplanned hiatus. I hope you all had a wonderful Christmas, and a happy New Years eve and day spent with loved ones making memories, relaxing and of course enjoying lots of good food. The month of December was soo busy but possibly the best month of our year. I knew we weren’t going to CA for Christmas so I had to make sure I got all of our Christmas gifts for our family way in advance so they could be wrapped and shipped off in time. We had our last home game of the regular season with family and friends visiting and got our 8th win of the season! Then we found out we were going to the Idaho Potato Bowl and started planning for a week long trip to Boise for the game…that I majorly over packed for and am stilllll trying to finish all of the laundry from. We had a bunch of family drive to Boise for the bowl game and got to spend some good quality time together that week and do a mini Christmas. I have literally never been more anxious, excited or proud of Eric or a team than at that game. All of their hard work and dedication paid off and we WON!!!! (I’m still on a major high from it!) After the bowl week, we headed to Eric’s Aunt and Uncle’s cabin in New Meadows and got to relax and spend Christmas there with Eric’s brother Larry and his wife Sheraden. And now, we’re finally home and enjoying relaxing and spending time together before vacation ends for Eric. While we were off on vacation I was thinking about all of the things I wanted to do to better myself in the new year. One major thing was to get back to eating better,that’s where this bright Mango Orange Smoothie comes in. My motto over the holidays was, if I’m not full I should probably start eating again, and I can finally feel the repercussions of those choices. I made the ultimate bad food choice the other night by having dinner…then ice cream with cookies added on top…and then an hour later having some chips and dip…. it was not one of my best choices. Hopefully by putting it out there I’ll never do that again! Not only did I take a break from blogging, I took a break from working out and I am feeling soo sluggish. I’m ready to get back to my normal routines and taking better care of myself. This Mango Orange Smoothie is exactly what I need to get back on the right track and if you’ve been enjoying all the things like I have it’ll be great for you too! It’s fresh and bright from the orange zest, orange juice and frozen mango. Has a silky smooth texture from the coconut oil that adds a slight coconut flavor and is really good for your skin and digestion. It’s also perfectly creamy from the almond milk and frozen banana. If you’re in need of a jump start to get back on track like I am, this Mango Orange Smoothie could be a great choice. Wishing you all good health, happiness, and many blessings in the new year! 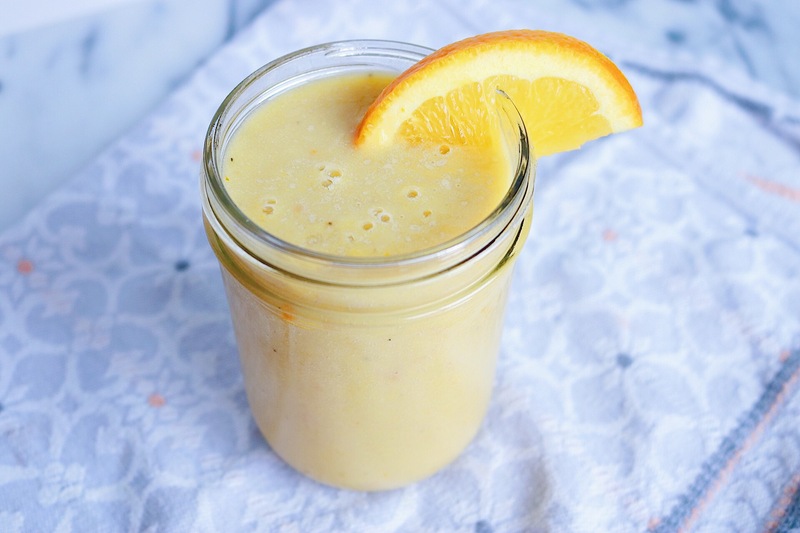 A bright and fresh Mango Orange Smoothie! Add the almond milk, banana, mango, orange zest and orange in a blender. In a small microwave safe dish add the coconut oil and microwave for 30 seconds, until it is in liquid form. Stir the honey into the coconut oil and pour over the ingredients in the blender. Blend all ingredients together until smooth. Pour into one 16 ounce or two 8 ounce glasses and enjoy! Thanks for stopping by CB EATS. Follow CB EATS by subscribing to email updates or follow along on Instagram or Pinterest. This sounds so amazing ! Thank you!! It is so refreshing!